This morning, Hubby and I took the babes to Toys R Us. We needed a new exersaucer (or something similar) for J to practice standing and stepping in. Why don’t we just use the one we had with EK? She’s only two; it can’t be that old. Glad you asked, friend. In fact, it wasn’t that old, and J did use it. Both my kids loved it. EK would stand next to it and show J how to make sounds on all the little attachments. One day, EK decided that since J wasn’t standing in it right that minute, she’d like to give it a try, for old times sake. So she climbed in and acted like a baby for a while. I was at work, Hubby was working on his laptop and J was playing on the floor. Since she seemed happy in there, Hubby just let her hang out. (Disclaimer: I would have done the same thing.) After a few minutes of happy playing, Hubby noticed an odor. And some squishing. And EK rubbing her hands all over the top of the toy. And you can guess what was happening (I really gave it away in the title). Weak stomachs, stop here. It’s going to get graphic. She had pooped, wiggled around a little too much and gotten it out of the diaper, and then stuck her hands down in it to see what was going on down there. And then chaos really ensued. Because she couldn’t get out, she was grinding the poop into the bottom of the toy, which just so happened to be a piano keyboard (aka lots of cracks for the poop to get into). The fabric seat was covered, and all the toy attachments on top were covered too. It’s a miracle that she couldn’t get out, so the mess was (semi) contained. Hubby ended up throwing away her clothes and the toy, and giving her and himself a bath. It’s really too bad- we loved that thing. 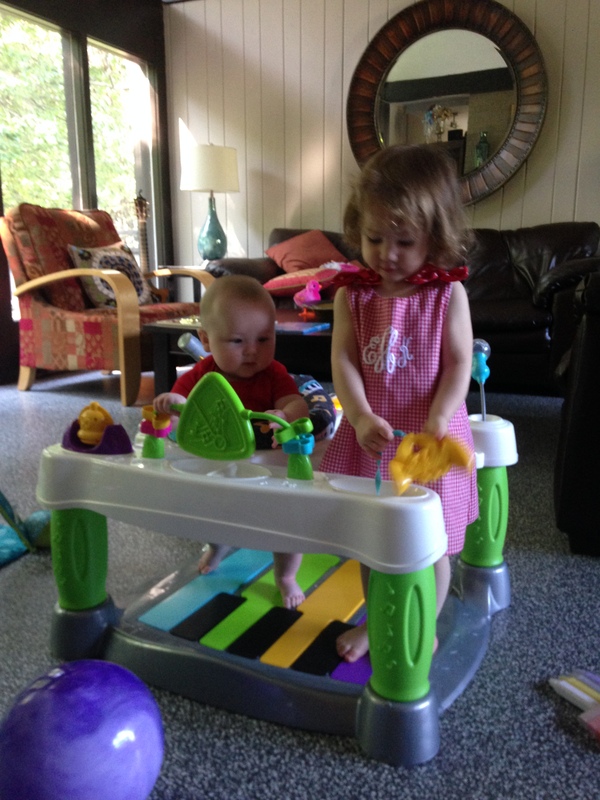 So there’s the story of why we needed to get a new exersaucer. Do you have any similar stories? So, Hubby’s parents have a lake house. They are the sweetest for sharing it with their three crazy sons and their families. 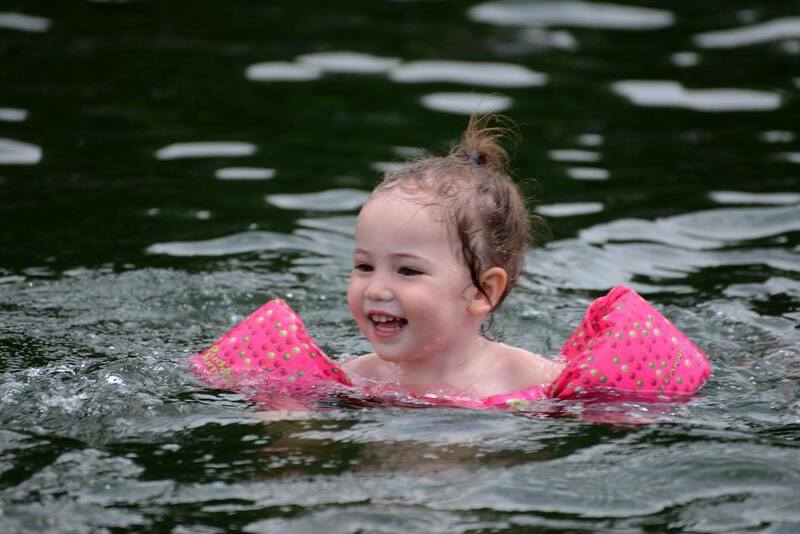 As my toddler takes to water like a fish, she is especially grateful for a day at the lake here and there. Hubby’s mom has been giving her swimming lessons at the pool, and she is f.e.a.r.l.e.s.s. She is actually getting the hang of the kicking and keeping her face out of the water. But she always wears her Puddle Jumpers (I mean, hey, she’s two). These things are lifesavers (pun intended?) because they are a lifebelt and “water wings” combined. Also, they’re covered in a fabric similar to what all swim suits are made out of, instead of the blow-up, bare plastic, scratchy arm bands. There’s honestly no way she could get out of them, and that’s my favorite part. I don’t have to worry about her jumping off the tube or treading water without holding onto someone. She’s afloat in an actual life preserver (seriously- it’s a certified life preserver, can be used on the boat, etc). Our Puddle Jumpers are from Costco, but they’re available at Amazon, Wal-Mart, Toys R Us, Target and more. 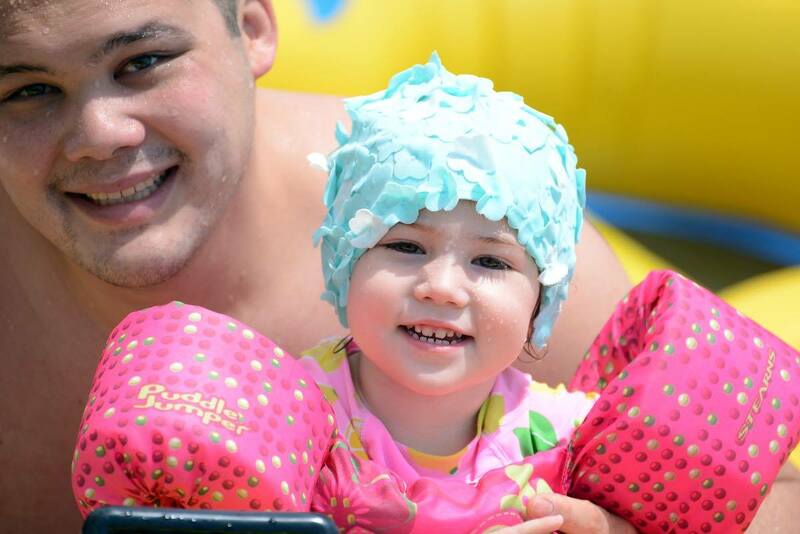 Speaking of useful things to have when swimming… that little bathing cap? Totally a Target find. 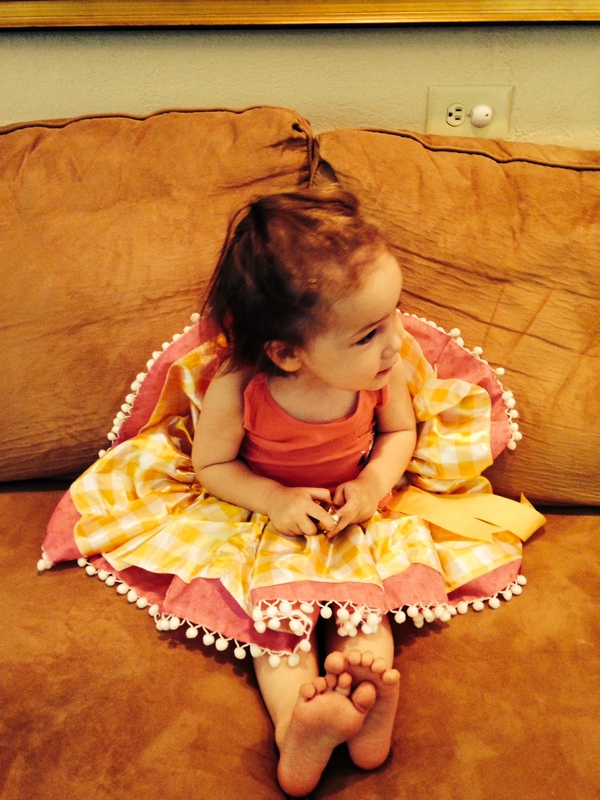 It’s the Circo Infant/Toddler Floral Swim Cap, and it’s on clearance, so hurry! There’s a slightly different one that’s pink and not on clearance, but still with the little flowers attached. I don’t have a picture (unfortunately) but J has some trunks and swim shirt from Carter’s that we LOVE. He also borrowed a straw fedora from a friend, and looked like a stud muffin. 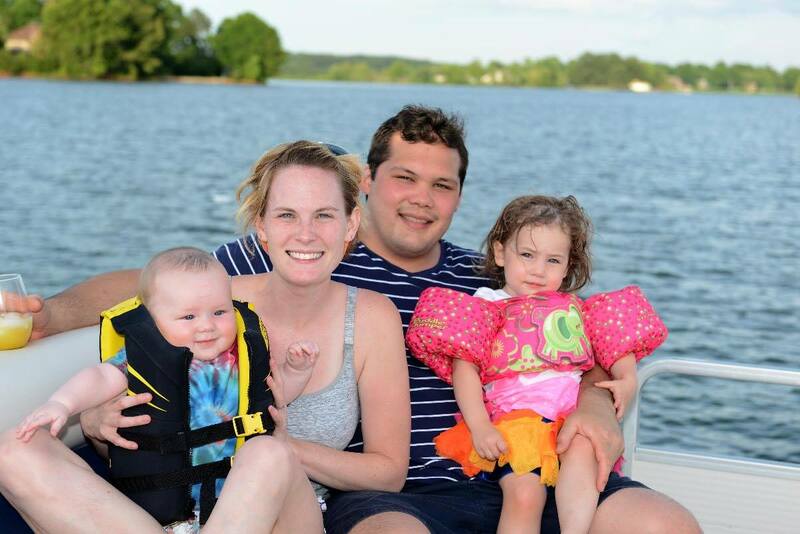 Bottom line: Hubby and I have been blessed with water babies, and we are glad, because we love the water, too (and the sun, and the boat, and the water skis/wake board)! However, I hope I haven’t passed on my pasty white, easily sunburned skin; we’re of course greasing them up with Blue Lizard, but hopefully they won’t get sunburned just from walking to the mailbox like I did as a kid! We’ve had two day trips to the lake so far this summer, one a couple of weeks ago, and one just yesterday. It’s only an hour away from home, so a day trip is easier than an overnight trip for us right now. Both times, we had some trouble with naps. When we’re at home, EK takes one big afternoon nap most days- she’s trying to drop it and I say, “Heck no!” because we all need a little break, right? J still takes several naps throughout the day. Anyway, on both trips, EK fell asleep watching a movie in Hubby’s mom’s bed (not at ALL typical) because she wouldn’t go to sleep the way she normally does (sippy of warm milk, blanket, kisses and leave her alone to sleep). J was so excited with everyone and all the sunshine that he would only nap if someone was holding him (typically he lays in his crib just fine for at least 45 minutes, and sometimes 2 hours depending on the time of day). So naturally, by the time we had dinner, took the evening boat ride, and packed into the car, it was meltdown city for the first half of the drive, and passed out kiddos for the second half, throwing off any semblance of a bedtime schedule we had left. But hey- this is going to be our summer, so we will figure it out! We have such a fun time that honestly, it doesn’t bother us that much. 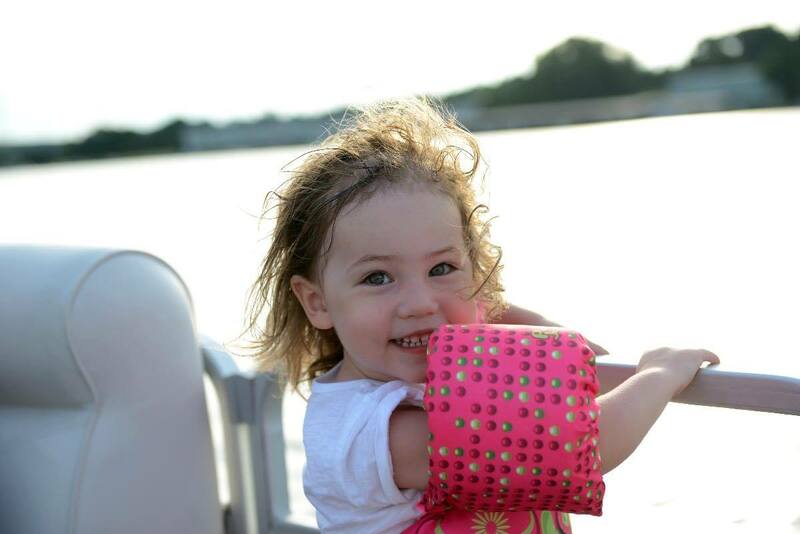 Gorgeous girl, loving the sunset boat ride. We’ve got windy boat hair and we don’t care. Photo credit for the photos in this post goes to my fabulous father-in-law! Do you have any swim wear recommendations? Suggestions for balancing rest and play on a day trip? We need to hear them! Here I am, sitting on my school laptop, on my very last day at school. It’s definitely bittersweet – with a little more bitter than I expected. Don’t get me wrong… it is SWEET! But I have a few tears in my eyes as I think about this part of my life drawing to a close. I have made some sweet friends here, ones I hope I don’t lose. I have gained a lot of experience, professional and personal, that I plan to be able to use again once my kiddos are all in school and I’m back in the teaching saddle. I love this school. I love the kids. I love the parents. I love the staff. But things are changing; there was bound to be an overhaul here, and I just happened to go out right at the time of the changes. Maybe the timing was for the best – God knows what I need, so I guess it really is. But I will say this: It’s been long and hard. In some ways, it’s gotten easier (my feet are wet, I know what I’m doing, and I’m more comfortable in the classroom every single day). In a lot of ways, personal/family-wise (being a working mom, nursing while working, missing milestones, scheduling around my work and Hubby’s work) and job-wise (lack of job security in NC, frozen pay scale, more and more requirements with no return) it’s gotten harder every year. I’ve been out on two maternity leaves with barely any pay (if you’ve taught less than ten years, you don’t have much time accrued to spend on long-term leaves), I’ve breastfed babies after going back to work, one of whom (EK) didn’t nurse. I’ve missed first steps, giggles, get-togethers, and family time. Lord, how excited I am to be around for all of that. To nurse my baby several times a day instead of pumping all the time. To see J crawl, and then walk for his first times. To take EK to her first day of preschool instead of just hearing about it from Hubby. I’m going to be a full-time mom! Woo! So, in honor of the day my life is totally changing, a toast. I likely will be toasting this with Hubby, with a drink in my hand, around 3:00pm today. Here’s to God’s timing being perfect, to working moms who are missing things, to stay at home moms who are sacrificing everything to be home with their little ones, to teachers in the trenches who do way more than they get paid for, and to my family, who supports me, loves me, and makes it possible for me to do what I love. Cheers. and to the silly ones that make my life complete. Here’s a little background information on EK to make this story a little cuter. As soon as she started sleeping through the night, she started sleeping late. I mean… really late. There were times she’d sleep till 10:30am. It didn’t even ruin her nap for her to do it! She’s always been a great sleeper. This (calendar) year, she has gotten a brother, moved to a big girl bed, and stopped sleeping so late. The “spring forward” really screwed us big time. What had been happening was she’d wake up around 7 or 7:30, roll around a little, play with her animals a little, and fall back asleep. I was always gone for work, and Hubby sleeps hard and sleeps late, so he wouldn’t hear her if she wasn’t making a LOT of noise. This morning, J got up a little earlier than usual, about 7. He typically sleeps till 8. His sleeping hasn’t been as good this past week, because he’s rolling to his belly, and then can’t get back over to his back. So I went in, changed his diaper, and hunkered down in the (La-Z-Boy) nursing chair with my coffee and a book to nurse him back to sleep. Usually if he’s up early, the first time he eats he’ll snooze a little longer. After a few peaceful minutes, I hear EK’s door open. Pitter patter… Pitter patter. J’s door opens; a tiny face peeks in. Cue her face-wide grin that I can’t get enough of. She tiptoes over to us, points, and says, “Baby!” because it’s the only thing she will call J. She scratches her chest (I think she gets it from Hubby), looks down, realizes her pajamas were actually just a t-shirt last night, and looks up at me in surprise. This is where it gets really cute: she throws up her index finger, in the “I have an idea!” way, says “Pants!” and runs out of the room. She comes back in with a pair of pants she’s been dying to wear that are still too big (long-waisted, skinny gal that my daughter is). Trying to distract her from the pants so I can hide them again, I tell EK to bring me a diaper and wipes so I can freshen her up. J is too distracted now to nurse anyway – he’s a typical lazy guy. She brings me these items, and also the pants (how does she keep getting them?!) so I go ahead and change her diaper and put on the giant pants. Then I have an idea: What if I can find a makeshift belt? She’d be so happy! The first thing I think of is ribbon – no way, packed up in the basement, and it only comes out at Christmas. Then I spot a Mardi Gras-style beaded necklace on the floor. I grab it, and wind it through the loops on the too-big, turquoise jeans with anchors, because my daughter is super trendy. Immediately, I see on her face (“Belt! Belt!”) that I’ve made her morning. She hasn’t even asked me for juice yet, so I know I’ve been blowing her mind with this belt thing. Honestly, it didn’t even work (there’s still a huge gap), but she’s got shiny beads attached to her favorite pants she’s never been able to wear. So what does she do? Go running and yelling into our bedroom to show a snoozing Hubby her new belt. This, folks, is the reason I wanted to stay home with my kids, at least for a little while, at least while they’re tiny. When I have to be at school at 7:30 and I have late sleepers, I miss these cute morning antics. Mornings are the most easygoing hours for most kids, and I’ve been so sad to miss what happens. Hubby is great about sending me sweet photos of morning snuggles, playtime, or silly breakfast happenings. But I am so blessed that we have decided I can stay home and experience them for myself. 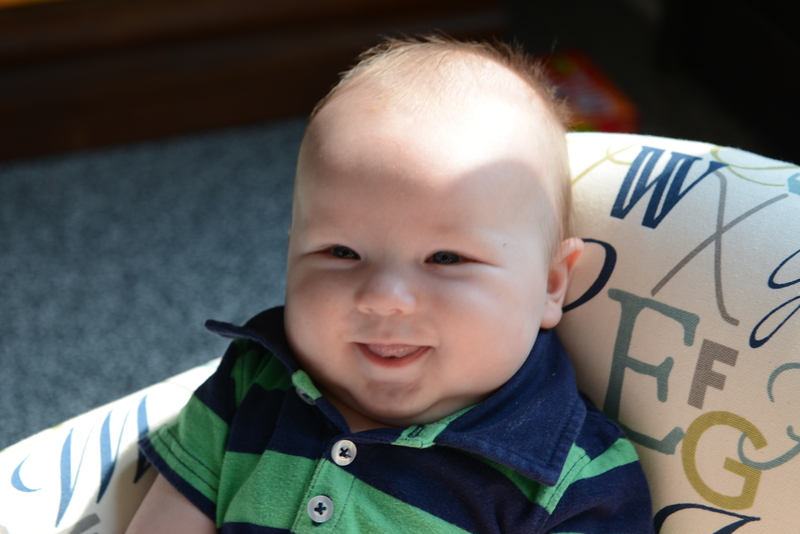 A teacher friend of mind gave me the best advice I’ve heard yet: “You’ll never regret staying home with those babies. Even if you have to eat pork and beans for dinner every night, you’ll never regret a minute.” So yes. I’m doing it. And I’m a happy mama. She obviously isn’t wearing “the pants” but this captures her fashionista personality perfectly. Sometimes, I miss the feel of a book. I miss actually turning pages, and smelling the “new book smell” the first time I crack it open. But I read a lot. A LOT. And I truly do think (cue Kindle commercial) that the greatest thing about my Kindle is that I take an entire bookshelf with me without an extra suitcase. As I prepare for vacations, or spend naptime on the deck in the sunshine with a book, I’m always needing suggestions for my next book to read. With that in mind, these are a few books I really enjoyed last summer that you should look into if you haven’t read them yet. I had read The Time Traveler’s Wife years ago, long before the movie came out, and loved it, so when I heard that the author had another book out, I was excited to read it. The book immediately captured my attention and I couldn’t put it down. It was thought-provoking, and different than anything I’d ever read. About two sets of twins and some inexplicable connections between them, it bordered on a fantasy novel but was too realistic (read: “normal”) to really fall into that category. It’s a riveting read that you’ll plow right through! Originally, I only downloaded these books onto my Kindle because I had been reading the Stephanie Plum novels by Janet Evanovich, and they were cheap “suggested reads” from Amazon. Abducted, Dead Weight and A Dark Mind are the three books in the series. I enjoyed them just as much as the Plum novels- easy reads, enveloping stories and interesting characters. Great mysteries, interesting female lead, and there’s always a twist. Great for a vacation read! The title says it all: a witty, cynical, and hilarious memoir. Jen goes from a high-paying, successful job to unemployment in the blink of an eye, but her lifestyle has a hard time catching up. I literally laughed out loud several times while reading this book, and also read passages aloud to Hubby so he could laugh with me. 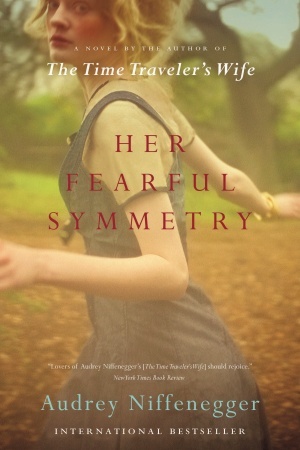 Everything about her writing style is fabulous, but should be taken with a grain of salt. She’s overbearing and brutally honest, but enjoyable. So what are some suggestions for me? I need some riveting summer reads! Anyway, one afternoon Anne came over to our house to help us get our laundry under control. (Laundry is our #1 parenting plight. In a family of 4 clotheshorses, we are constantly drowning in either dirty or clean-but-not-yet-folded clothes.) Anne and I were sitting in the floor of EK’s bedroom, folding her clothes and stuffing them into drawers. Hubby was cleaning the kitchen, with J in his bouncy seat in the floor. EK was running around the house, bringing toys from one room into another and back again. Anne was being her sweet, encouraging self, and telling me what a good job parenting Hubby and I were doing (oh, just wait). She was saying how compassionate and obedient EK is, and all sorts of other sweet things about Hubby and me. After a few very productive minutes of chatting and folding, I realize it’s too quiet. Parents of toddlers, I’m sure you’re all cringing right now because you know what that means. All of a sudden, I hear a huge thud – like a noggin hitting the floor – and EK cries out. I rush to the hallway, and see her lying on the floor… the wet floor. Now, my first thought is a spilled glass of water; Hubby and I are sometimes bad about leaving our water glasses within reach. I scoop her up to my chest and comfort her, ask her where she hurts, etc. Upon inspection, I realize that there are little pieces of wet, white stuff on her clothes and on the floor. Then I follow the trail… to the bathroom… and to the toilet. And then I gasp. I manage to maintain calm (sort of). I assess the toilet situation as way too full to flush (the better part of a roll of toilet paper was inside), so I call on Hubby to take care of the bathroom. I take off EK’s clothes. I take off my clothes (because I’ve been clutching her sniffling self to my chest, and am now covered in toilet water). I look down the hallway, and see a trail of water and mushy toilet paper leading to the kitchen. Where in the kitchen, you ask? Why, with my then 3-month-old son in his bouncy seat, of course. Hubby says, “I saw her playing with him, but didn’t realize she was wet!” Codswallop, in my opinion (forgive me that HP reference). After we are showered, floors are cleaned, and naps are in progress, I have a good laugh with Anne. There I had been, glowing with pride as my success as mother is praised, as my toddler played in the toilet, trailed the water all over the house, and then slipped in it. It felt like an epic #momfail, but then again, everyone is fine and we have a hilarious story to tell. I want to hear about your most recent #momfail too! We at the Daily Geekette would like to wish a Happy Father’s Day to all the amazing dads and grandpas out there, especially those raising quirky little girls like us.